Get the evergreens you need from a place you can count on. 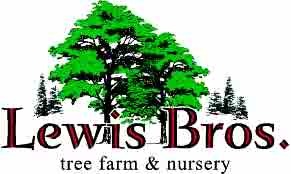 From a wide selection of healthy evergreens to full-service delivery and planting, the experts at Lewis Brothers Tree Farm & Nursery are here for you! Get year-long greenery for fashion and function. If you need a natural snow break or border tree, nothing beats the year-round beauty of an evergreen. 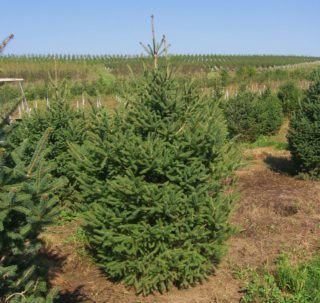 At Lewis Brothers Tree Farm & Nursery, we’re proud to offer you a wide selection of young to mature evergreens along with expert advice and full service delivery. Put our experienced planting team to work, and take advantage of an optional 1 year warranty for health and survival assurance on your new tree or trees for the peace of mind in your investments that you deserve. Call to schedule an appointment in our nursery. Our 5,000 tree nursery is open by appointment, and our experts are here to assist you with selecting one tree to many. There’s no commitment necessary to come and have a look! White Spruce gradually reaches 60 feet in height by 20 feet in spread with a slower growth rate, and adapts to a variety of harsh soil and sparse moisture conditions. Its growth habit is upright pyramidal and it often remains branched and foliaged to the ground, unless it is limbed up into a more stately tree form. 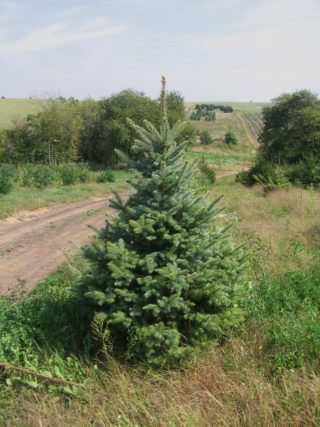 Its needles are noticeably shorter, as compared to Norway Spruce or Colorado Spruce. Soil Conditions: Adapts well to a variety. Although it is commonly seen in forms that display blue or blue-silver needles, green-needled forms also exist. Many selections have been made for both foliage color and growth habit, the latter of which may be dwarf, weeping, broad, columnar, or formally pyramidal into maturity. 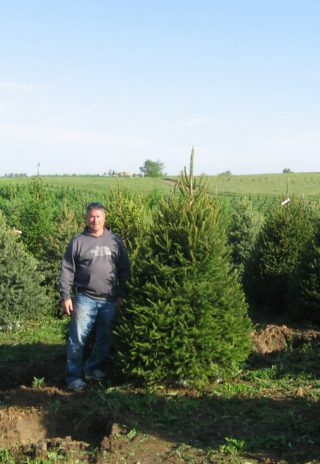 Norway Spruce quickly reaches 80 feet in height by 40 feet in spread with its medium to rapid growth rate, and adapts to a variety of harsh soil and sparse moisture conditions. It is so common, widespread, vigorous, and healthy that most people do not realize that it is not a native of North America, in spite of its common name. It is found as an ornamental tree in urban environments, a windbreak and snowbreak in both urban and rural areas. 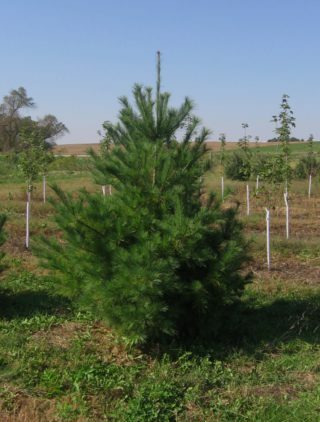 White Pine is commonly transplanted today as a landscape evergreen tree, and is also sold as a cut Christmas tree. This towering evergreen easily grows to 80 feet tall by 40 feet wide or larger under optimum conditions, with a rapid growth rate. Its shape is upright pyramidal when young, but becomes irregular with maturity. The very straight trunk of White Pine is punctuated by a whorl of lateral branches every one to two feet.